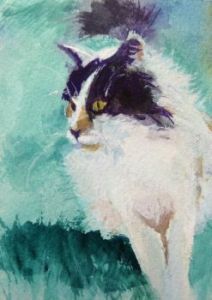 Morning Prowl- 2.5" x 3.5"
She tolerates the dew on the grass because the hunting is so good. 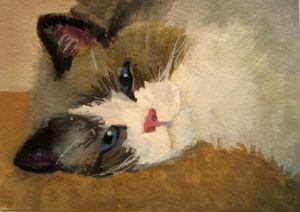 Lazy Blue- 2.5" x 3.5"
Thanks to Nancy Jay for the use of her photo of this lovely, lazy cat. 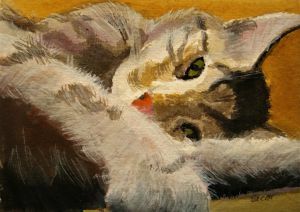 The Paw- 2.5" x 3.5"
Julie Rolston let me use her photo. The paw became the whole topic of this little painting. 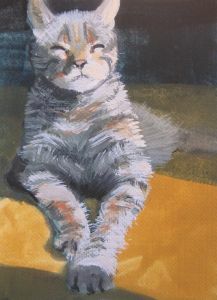 Street Cat at Home- 2.5" x 3.5"
He looks pretty content in that patch of sunlight. 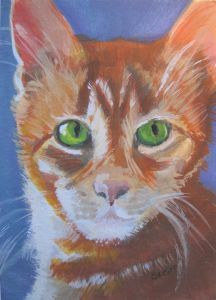 Morning on Orange- 2.5" x 3.5"
I wonder what this cat was staring at? Thanks to my friend Julie Rolston for the use of her photo. 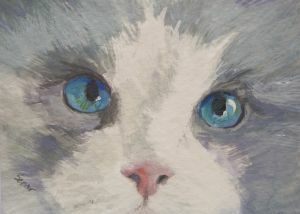 Nancy's Gray- 2.5" x 3.5"
My friend Nancy Jay's gorgeous blue-eyed beauty. 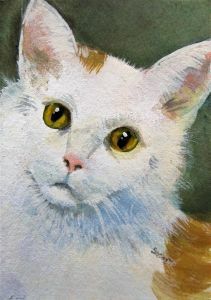 My online friend Chris Neidhofer allowed me to use her photo to paint Gatsby. Love those eyes!